Of course we now know that, almost 2 years down the road, little withing the country seems to have changed with regards to the financial and political mega-scandal that is 1MDB; the task force has publicly produced absolutely nothing, and Prime Minister Najib Razak still has not sued the Wall Street Journal. No one has thus far been held accountable, no one has been brought before a Malaysian court, and we are no closer now to establishing, confirming or even disputing the facts first alleged by WSJ – most recently re-raised in greater detail by the US Department of Justice (DoJ) – than we were two years ago. Very few local media are brave enough to carry non-government opinions on the matter, especially after The Malaysian Insider and The Edge were muzzled. Questions on 1MDB have even not been allowed in Parliament. Threats have been made to sue people for postings on social media (but so far we’ve not heard if they’ve followed through). Is this the face of the future of Malaysian democracy? At a time when Khairy has been going round the country, either holding TN50 townhalls or the SEA Games torch, he has said absolutely nothing about the latest DoJ civil suit attempting to forfeit USD1.7 billion in assets alleged to have been bought using money siphoned out of 1MDB and laundered via the US financial system and banks. 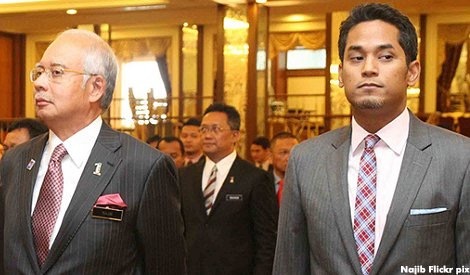 Khairy’s ‘elegant silence’ on the issue this time round is either a distinct mark of poor leadership or a strategic distancing from the political armageddon. This is made more telling when his other cabinet colleagues have been more upfront in their defence of Najib. The truth is that 1MDB – particularly the way the Najib administration has dealt with it – has hurt the youth and the future. Malaysians across ethnic groups and the socio-economic spectrum have said in numerous polls and surveys that corruption and the economy are two of the most important concerns for them, yet the handling of the 1MDB imbroglio has not inspired confidence in the people. I’m not sure if Putrajaya realizes that when the media reports that the latest DoJ filing allege that Jho Low purchased a USD27.3 million pink diamond necklace for Rosmah Mansor, this mind-boggling amount is far beyond the realistic reach of probably 95% of Malaysians but especially the youth. Assuming a fresh graduate at 21 earned RM2,300 per month with a salary increment of 10% per annum, saves 15% per annum, AND the the person is able to remain employed for 50 years, this young Malaysian would still need to find well over RM110 million by the time she/he reaches 71 years old in order to buy that pink diamond necklace at the price that Jho Low allegedly paid. In other words, the allegations made about the 1MDB scandal are so astounding and the amounts involved so ridiculously distant from the reality of most young (and old) Malaysians, that we can’t help but ask: Whose money did they use? Was it legal? And why is nothing being done within Malaysia about this? That is why I propose that nationwide townhall sessions be held after Raya to specifically discuss 1MDB, the DoJ allegations, and the future of Malaysian democracy. I believe that Khairy is too afraid to do this, or he may give any number of other politically convenient excuses. His silence on the latest DoJ filing has already revealed this about him. In any case, the country and our future should not be the concern of one side of the political aisle alone. This is our country, our future, and therefore we have to stand up for it together. This entry was posted in Media and tagged 1mdb, DoJ, Jho Low, Khairy Jamaluddin, najib razak, Rosmah Mansor, SEA Games, TN50. Bookmark the permalink.